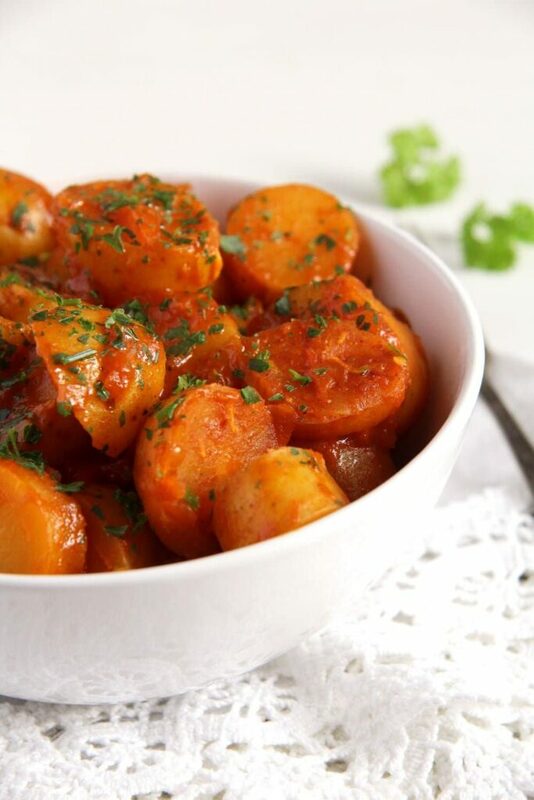 Soft new potatoes cooked in tomato sauce, an easy vegan main meal or a delicious side for most anything you can think of. We have such beautiful weather today, so nice and sunny I can’t stop myself from mentioning it. I have my table and my computer near a window and it is just so nice to see the open field opposite our house and the small insects flying in the warm sun. I just hope this will last for a few more days, we definitely need it after so many wet, gray and cold days. 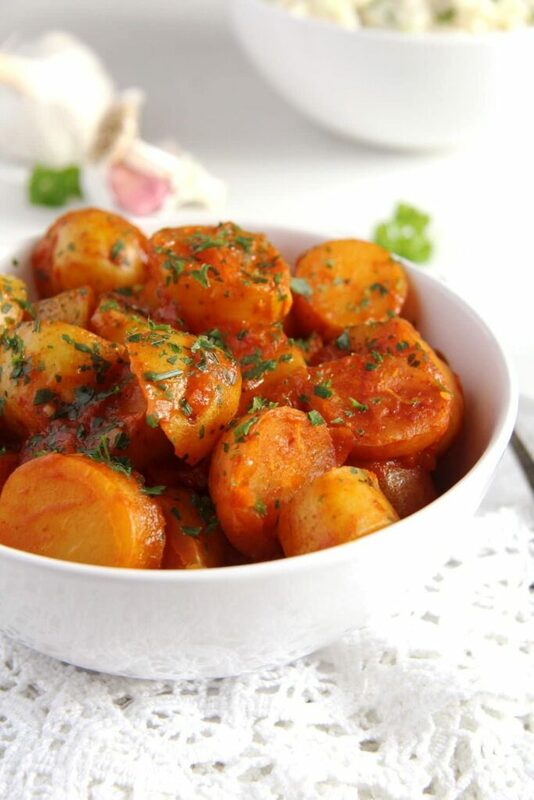 I have a nice and easy recipe for you today, something that fits the easiness and lightness of the day, a simple dish of new potatoes in tomato sauce, something suitable for a fasting main meal accompanied by a nice salad or some pickled vegetables for instance. 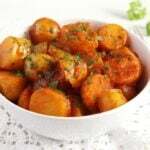 If you are not fasting and also not eating vegan, you can make these potatoes as a side dish for any kind of meat dish you happen to cook. Or you could fry or poach some eggs and have them with these wonderful potatoes. The last time I cooked them, we only had some cauliflower salad on the side and we didn’t need anything more. 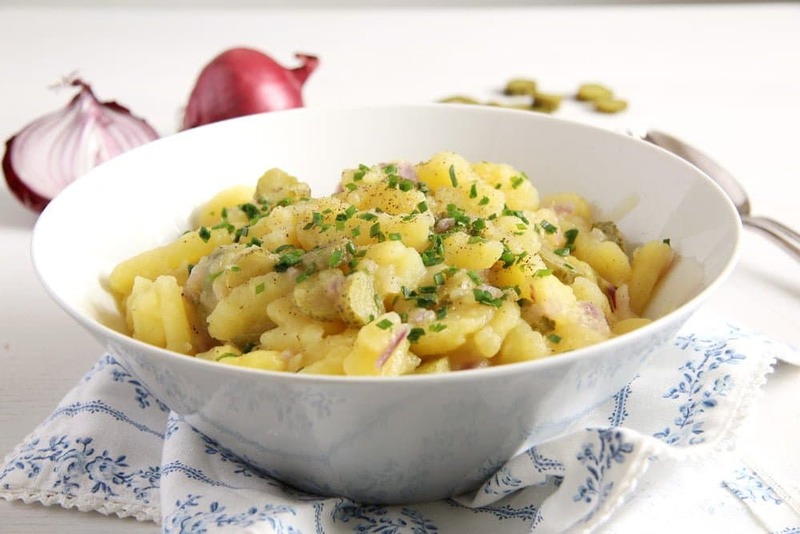 I love the softness and sweetness of new potatoes and as long as I can get them, I buy and cook them in a rather simple way that emphasizes their special taste and consistency. 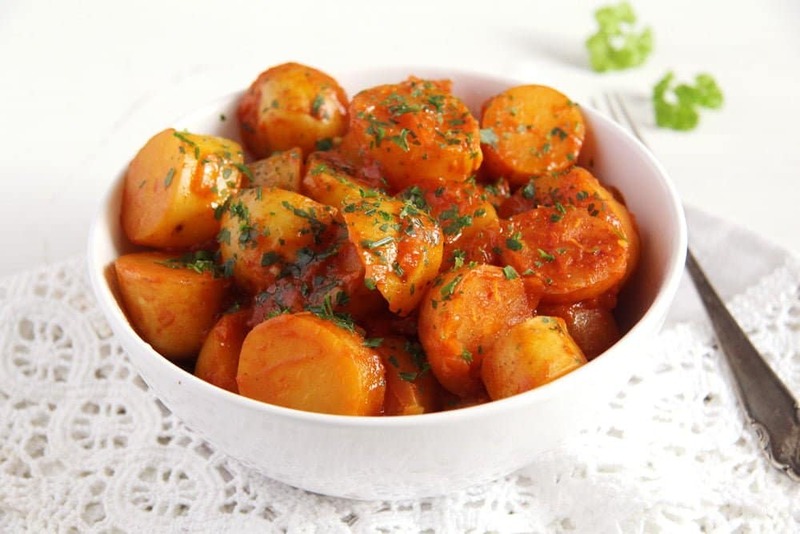 I used the basic tomato sauce from last week to make the sauce for these new potatoes, but if you don’t want to make your own tomato sauce, you can use any brand you like. However, like always, I recommend making your own sauce (my recipe or your favorite recipe), it always tastes better, I think. If you don’t have any tomato sauce at all in the house, no need to worry. You can replace the tomato sauce with 2 tablespoons tomato paste and 1 tablespoon pepper paste and add more vegetable broth, about 400-500 ml/ about 2 cups. It tastes a bit different, but still delicious. Wash and clean the potatoes very well. You can leave them unpeeled, but make sure they are very clean. Slice them into thick slices. Chop the onion finely. Heat the oil in a cast iron skillet or a non-stick pan. Cook the onions on medium low heat until translucent. 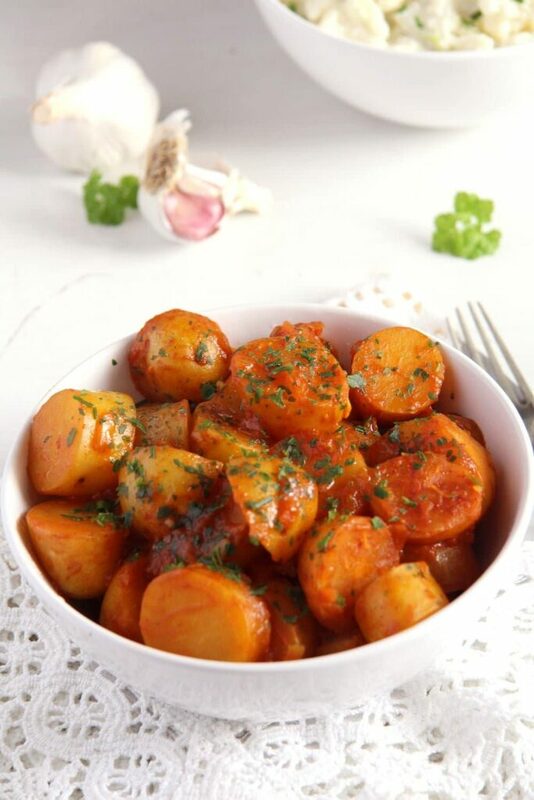 Add the potatoes and the tomato paste, stir well and cook them for about 2 minutes, stirring often. Add the tomato sauce and the vegetable broth, some salt and pepper. Mix well, turn the heat to low and cover the pot leaving a small crack open. Cook for about 20-25 minutes, stirring several times in between, until the potatoes are tender. Add a little bit more vegetable broth if the dish becomes too dry, I added about half a cup more vegetable broth. Grate the garlic cloves, add them to the skillet, stir well and cook for further 2 minutes. Sprinkle with chopped parsley or chives. Serve hot. 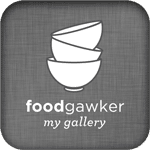 You can replace the tomato sauce with 2 tablespoons tomato paste and 1 tablespoon pepper paste and add more vegetable broth, about 400-500 ml/ about 2 cups. It tastes a bit different, but still delicious. Two of my favorite things together! 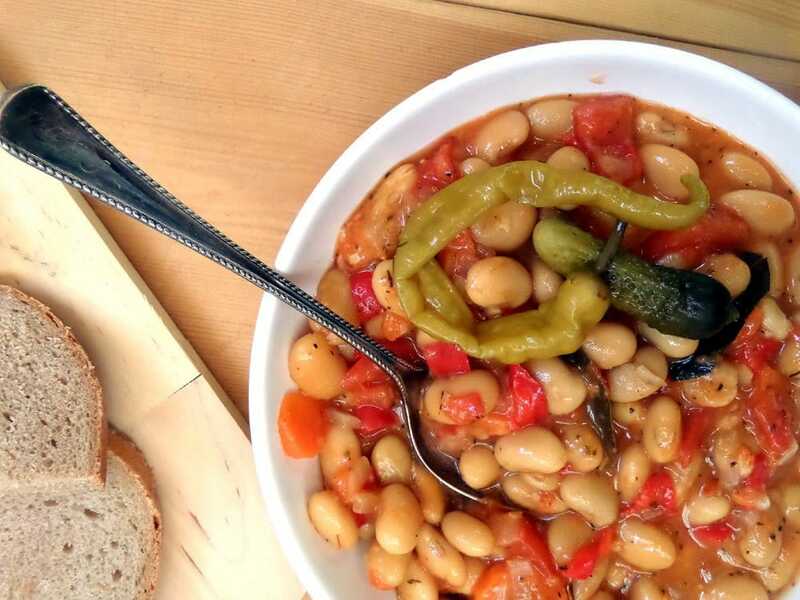 I could eat the whole bowl…totally delicious! Tomato sauce has the PERFECT way of jazzing anything up! This is a classy version of French Fries and Ketchup! haha! You know I love me some potatoes! I’ve never had them cooked in a tomato sauce but now I’ve got to try it! 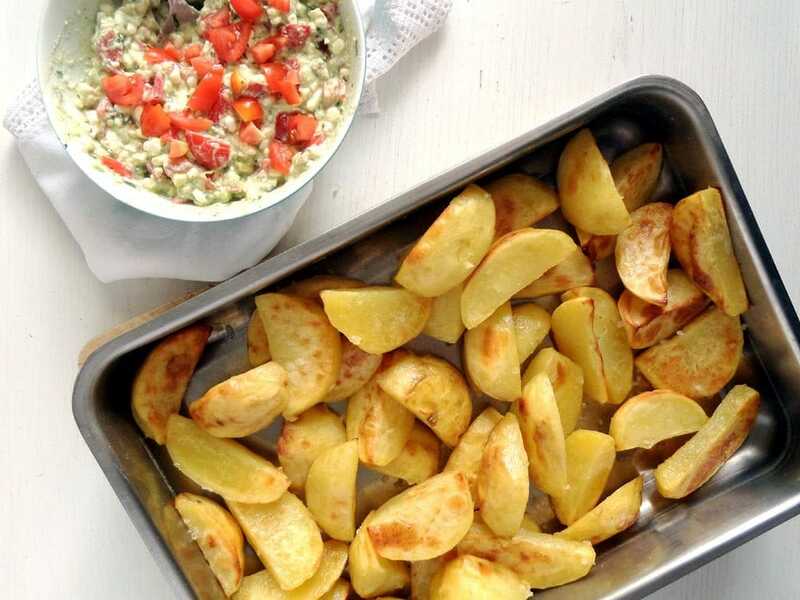 Hi Adina – I love new potatoes too. Makes me think of spring. I’m glad you are getting some mild weather there. I wish we could say the same. We had some mild weather a few weeks ago – but then we got over a foot of snow last night. Normally I love it, but it’s time for spring! Past time. Thanks for this great new recipe my friend! I love everything about this dish! 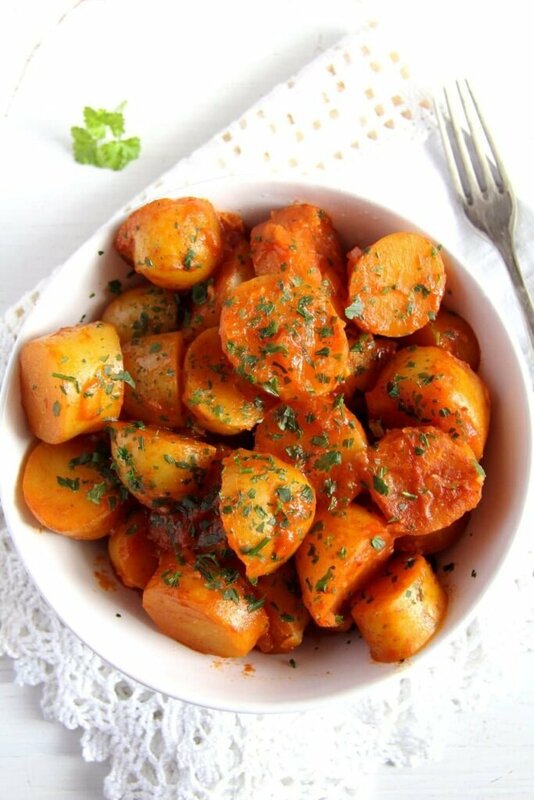 I absolutely adore new potatoes and this tomato, garlic and herb version is simply divine!! i get so excited when it’s time for new potatoes! i’ve never eaten them with a tomato sauce but it’s a delicious idea. What a wonderful recipe, Adina. Adore new potatoes. Love how beautifully you have the combined them with tomatoes. And garlic in this recipe sounds even more intriguing. They look so hearty and delightful!!! I put tomato with pasta and rice, but very seldom with potatoes. You’re changing that with this dish. It looks and sounds quite exceptional. Thanks! Lucky you! We don’t have new potatoes yet… I must check on Saturday at the market. Your potatoes look both delicious and original. And I’m all for the egg on top! Ah, what a beautiful, easy to make, perfectly delicious dish! Thanks for this, Adina!